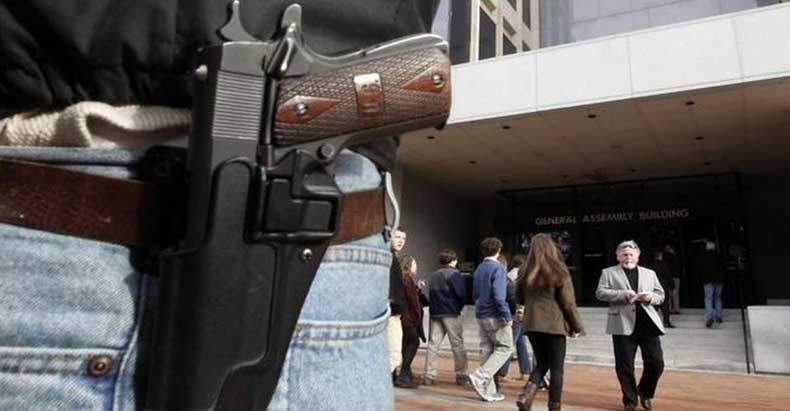 Grand Rapids, Mich. – In a stunning violation of 2nd Amendment rights, the U.S. District Court of Western Michigan ruled police have the legal authority to detain individuals that choose to exercise their constitutional right to open carry a firearm. Open Carry is also specifically allowed under Michigan law. The ruling means that people in Michigan who choose to exercise this constitutional right are now subject to being stopped by law enforcement for engaging in a completely lawful activity. Officers detained Johann Deffert in early 2013. He was walking down the sidewalk with a holstered FNP-45 pistol, after receiving a 9-1-1 call from a woman who spotted Deffert with the open carried, but holstered, handgun on his person. The dispatcher initially informed the caller that Michigan is an open carry state. However, the woman subsequently explained that she found Deffert’s presence alarming, due in part to his wearing of camouflage, although she admitted that he wasn’t threatening anyone. Somehow the dispatcher made the decision that someone engaging in a completely legal activity, as earlier in the call noted by the dispatcher, should now be inspected by police, due to caller saying they found wearing camo disturbing. The absurdity in logic; that someone wearing camo takes the situation from being a completely legal situation not to be interfered with, and raises it to a level of needing police assistance, shows the extreme arbitrary nature of the entire situation. The incident was captured on responding officer Moe Williams’ dash cam, and lasted 14 minutes. Williams had indicated he believed that perhaps Deffert was suffering from some type of mental illness, as he seemed to be “talking to nobody” when the officer arrived on scene. Upon further investigation, Deffert was revealed to have been happily singing the song “Hakuna Matata” from the Disney movie “The Lion King” while strolling down the sidewalk. The video shows the officer command Deffert to lay face down on the ground upon arrival on the scene. Deffert was treated as if he were a criminal that needed to prove he was not doing anything wrong, as the officer detained him while running a mental and criminal background check. Deffert was polite and respectful throughout the encounter, but strongly asserted his rights regarding open carry laws in the state of Michigan. Several months later Deffert filed a federal lawsuit alleging his constitutional rights were violated and that he was assaulted and falsely imprisoned. The legality of open carry in the Michigan was never in question, only if law enforcement had the authority to detain an individual simply because they were open carrying a firearm, according to court records. When a call to 9-1-1 is made in regard to a completely legal activity, the police should not even be dispatched. If in fact the police needed to “determine whether [Deffert’s] behavior gave rise to a need to protect or preserve life … in the neighborhood,” they need not impeded a citizen from going about their legitimate and legal business,” as Neff asserts, but rather could passively watch from a distance to determine if there is any reasonable suspicion of criminal activity afoot, and if so act accordingly. The most glaring problem with Neff’s logic, is that there is no reason for police to ever assess someones behavior who is simply engaging in constitutionally protected and lawful activity, regardless if another citizens takes issue with the activity. If the activity fails to rise to the level of criminality, then police have no business getting investigating or getting involved. The police, as public servants, aren’t paid to investigate non-crimes. The idea that someone needs to prove their innocence for engaging in a constitutionally protected activity is contrary to everything America teaches its children to believe about liberty and freedom. The case will most likely be appealed to the United States Court of Appeals for the Sixth Circuit. The National Rifle Association and others have offered to assist in the appeal. It will be interesting to see what open carry advocates across the nation, and specifically those in Texas, a hotbed of open carry activism, think about this ruling; and how they would respond if this were to become the standard of law in their state. Be sure to share this critical information with all your liberty loving friends!